A changing climate and higher wind speeds means that residential construction is likely to receive more damage in the future if design standards are maintained at the current level. The vulnerability of residential construction may be reduced by an adaptation strategy that increases design wind speeds specified by Australian standards. 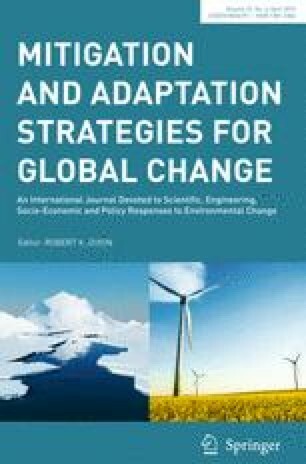 The paper applies break-even analysis to compare the risks, costs and benefits of climate adaptation strategies for new housing in the three largest cities in Australia: Brisbane, Sydney and Melbourne. These cities are located in southeast Australia where wind hazard is dominated by synoptic winds (thunderstorms and east-coast lows). Break-even estimates of risk reduction and adaptation cost for designing new housing to enhanced standards were calculated for three synoptic wind pattern scenarios to 2070: (1) no change, (2) B1 and (3) A1FI emission scenarios. If the actual cost of adaptation exceeds the predicted break-even value, then adaptation is not cost-effective. It was found that this adaptation strategy can lead to risk reductions of 50–80 % at a cost of approximately 1 % of house replacement value. If risk reduction is over 50 %, discount rate is 4 %, and there is no change of climate, the break-even analysis shows that adaptation is cost-effective for Sydney if the adaptation cost is less than 5–9 % of house replacement cost. Designing new housing to enhance wind classifications is also likely to be a cost-effective adaptation strategy for Brisbane and Melbourne. The author appreciates the financial support of the Commonwealth Scientific and Industrial Research Organisation (CSIRO) Flagship Cluster Fund through the project Climate Adaptation Engineering for Extreme Events in collaboration with the Sustainable Cities and Coasts Theme, the CSIRO Climate Adaptation Flagship. Advice from Dr Xiaoming Wang, Dr Paraic Ryan, and Dr Chaminda Konthesingha is greatly appreciated.